First appearance Is It College Yet? Lindy is a college student working at Governors Park who becomes Quinn's friend during Is It College Yet?. In the episode, Lindy appears as a nice and friendly young woman who quickly befriends Quinn when the latter starts working at Governors Park. They start to hang out in parties and going to the cinema. However, Quinn soon notices Lindy is an alcoholic. 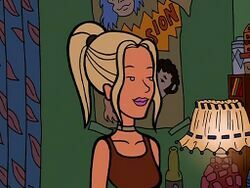 In a scene cut from the DVD version, she at one point mentions how she regularly drives tipsy. In a particular night, as the girls come from the movies, Lindy is drunk enough that Quinn even tries to give her a ride home in Upchuck's car, to no avail. When Lindy's drinking is discovered at work the next day, she tries to blame Quinn for the problem but ultimately fails to convince her boss, who fires her. Quinn becomes concerned and visits and confronts Lindy about her alcoholism, but Lindy denies having a problem and angrily throws her friend out. The two manage to patch things up somewhat by the end of the movie, when Lindy visits Quinn and offers her a mirror she had promised earlier. However, it's doubtful that Lindy has gotten her drinking under control. As she lives in Lawndale, she presumably goes to Lawndale State University. In her last scene, Lindy mentions her mother is an alcoholic. She uses that to claim she doesn't have a problem, as she's not as bad as her mother. The character is developed as Lindy Weaver-Lane in Richard Lobinske's Falling Into College series and in Party at Lindy's by Wouter Jaegers where she defeats her drinking habit. This page was last edited on 25 April 2018, at 18:32.